Follow-up to A Kind of Puritan, Deacon’s acclaimed first futurecrime novel: Humility’s back at Midway Port and ruthless patriarch Morgan Vinci wants her to find out why a man’s hanged himself on board one of the boats in his new marina. Just to complicate things, Humility’s mother wants her to track down a thirteen-year-old runaway. But how do you find one child when the city streets are full of homeless kids? Especially when they’re terrified of whatever is coming out of the night and making their friends disappear. When the missing children are linked to the hanged man's ferry company, his suicide needs a closer look. Humility quickly learns that good intentions count for nothing in a world where good wine is laced with poison, girl gangs will kill you if you step into their territory and nightmares are terrifyingly real. 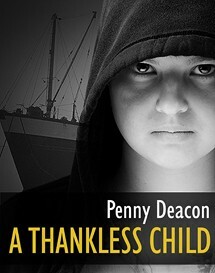 Penny Deacon spent her 20s living on a yacht and sailing between England and the Caribbean. She eventually turned respectable and took to teaching, but has always been passionate about both reading and writing. Six novels for Mills & Boon (under the name Lynn Jacobs) enabled her to take a break from the class room but a brief attempt at earning a living as an author led to a shameful existence as a creator of management workbooks. She returned to school, this time as a librarian (it’s such a good job for being subversive, plus all those books!). It was then that she discovered an unexpected reward for the ten years’ self-indulgent sea-faring: the germ of an idea for a series of crime novels. The result was A Kind of Puritan and A Thankless Child.